Evidence report looking at the advice and information needs of clients from A8 countries. A8 countries are Czech Republic, Estonia, Hungary, Latvia, Lithuania, Poland, Slovakia and Slovenia. The research findings are intended to help Citizens Advice Scotland (CAS) better understand the interface between this new client group and the capacity and ability of bureaux to deal with their needs. 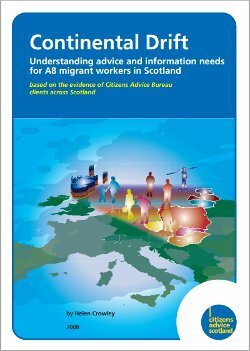 The research will contribute to the evidence base on new migrants in Scotland and inform CAS’s policy recommendations. to assess the impact of this new client group on the work of bureau advisers. Research evidence was gathered quantitatively using a client profile survey of 251 A8 clients who accessed the 13 bureaux that self selected to participate in the research. Advisers from these 13 bureaux from both rural and urban areas of Scotland completed a questionnaire that sought both quantitative and qualitative responses. A third element of the research was ten structured interviews involving clients from across these bureaux, and this qualitative data was complemented by anonymised case studies which further supplemented the evidence. The research was conducted from 1 November 2006 to 31 January 2007 and 4 April to 18 May 2007 respectively.